We all know I love a good snack-heavy Degustabox! This one did not disappoint. First off, I’m officially all about wafers. They’re a perfect light dessert options and I can have a handful without feeling guilty. The Bauducco Chocolate Wafers were surprisingly not sweet, but I liked them. I haven’t tried the GoCo Crunchy Coconut Bites but they sound pretty good. On the savory side I like Hippeas. 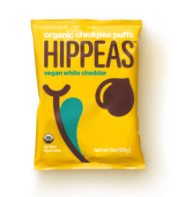 They’re little chickpea puffs and I think the Vegan White Cheddar is pretty tasty. The Handfuls BBQ Almonds were delicious, but I love almonds! The Better Chip whole grain chips sound good with Jalapeño & Cilantro. I need to get a good complimentary cheese to try these out or maybe some guac. I tested The Chia Company chia shots in my morning smoothie. I’m all for any extra nutrition I can get in there and I like how these are portioned out. I’m looking forward to trying the Garden of Life GOL Bar. My husband made off with the Mighty Spark Foods chicken snacks (a common theme in my Degustabox reviews) and my mom with the Idahoan potatoes. Potatoes are an easy one for me to throw together from the produce department, so I’d probably really only do maybe au gratin from a box. Same for the Marion’s Kitchen kit. Ordering Chinese or Japenese take-out is an easy out mid-week so it’s just not in my cooking repertoire. I’m a mustard fan so the Tigertail was a welcomed addition to the fridge.